West Ham's joint-chairman David Gold believes goalkeeper Robert Green will stay at Upton Park after the club gained promotion to the Premier League. The England international performed well in West Ham's 2-1 play-off final victory over Blackpool at Wembley. The 32-year-old's contract expires this summer, but Gold wants to resolve the situation as soon as possible. 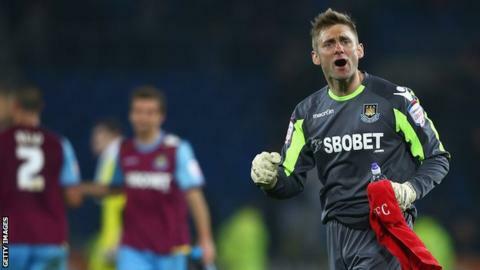 "One of the first negotiations that will take place will be with Robert Green," he told BBC Sportsday. "He is a world-class goalkeeper and his salary would be commensurate with that, but now that we are in the Premier League we can sit down with him. "I am confident that we can keep Robert." Despite spending a season in the Championship, Green received a Euro 2012 call-up from England manager Roy Hodgson. He will travel to Poland and Ukraine as Hodgson's number two keeper, behind Manchester City's Joe Hart. Gold said promotion to the Premier League at the first attempt was incredibly important. "There was no way we could keep Robert in the Championship in the second year after relegation by paying him his value," he said. Gold, who took control of West Ham in January 2010 with business partner David Sullivan, says the club will reassess the squad over the summer after securing top-flight football, with new arrivals likely. He said: "Some negotiations will start straight away and some will start in a few weeks. "Until all those things have been sorted out you're not quite sure what you will be doing, but you know you have to strengthen your squad to give you the best possible chance of staying in the division. "Once we've done all our negotiations with the players you want to keep, Sam (Allardyce) will come to us and tell us the areas we are weak in and need to strengthen, and this is what it's going to cost us. "A lot of contracts will be with players that go back onto Premier League wages now we have gone up."